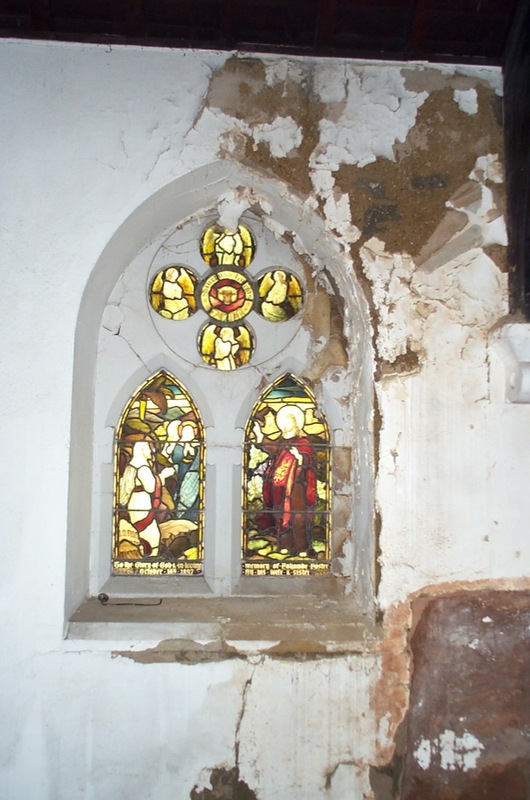 In April 2014, students doing the Certificate in Archaeology at the Institute of Lifelong Learning, Sheffield University were given access to St Silas church for a day to survey the building. “All the windows in the church are designed in the geometrical style. 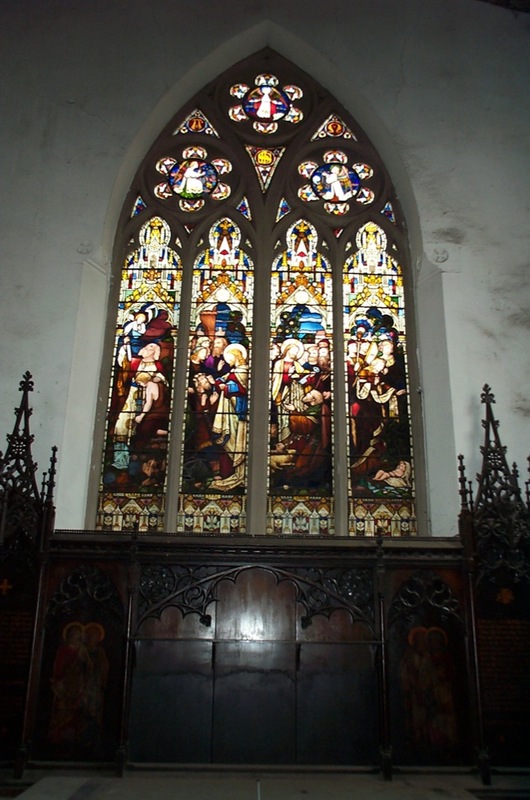 Each stained glass window depicts a story from the Bible in summary form, there is a lot of symbolic detail in the backgrounds which reinforces the narrative depicted, and the style seems to be influenced by the Pre-Raphaelite Brotherhood, formed in 1848 in London. As St Silas was built in 1867, this is very likely the case. Left to right the windows show: the Old Testament story of the sacrifice of Abraham and Isaac; the New Testament story of Jesus healing blind Bartimaeus; the New Testament story of Jesus giving St Peter the keys to the Kingdom of Heaven; and the Old Testament story of Pharoah`s daughter finding the baby Moses. Above these windows are three rounded windows which show the three Archangels: Michael, Gabriel, and Raphael. Sandwiched between these in triangular lights are the alpha and omega, symbolising from the Book of Revelation `I am the Alpha and the Omega, the First and the Last, the Beginning and the End` in reference to Jesus` authority as Son of God. Then in the middle, there is the IHS monogram which refers to the Holy Name of Jesus (an interpretation is IesusHominumSalvator meaning `Jesus, Saviour of Men` in Latin). Wooden panel below window: on the left, two of the Gospel writers, probably St Matthew and St Mark, then opposite on the right are two more Gospel writers, probably St Luke and St John. This window is in keeping with the Pre-Raphaelite style of those above the altar and in the outer walls to the left- and right-hand-side of the nave. It shows the Blessed Virgin Mary holding the infant Jesus, above them is an Angel. 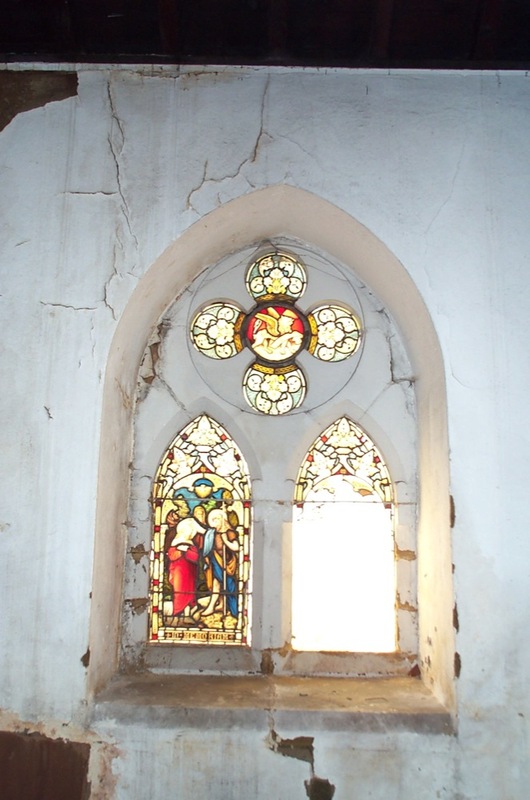 There is an inscription which reads `Alice Mary Mannder of the love she had for this Church gave this window 1929`. This window is in a completely different style to the others in the church and I would guess it was made either in 1969 or soon afterwards and it is in a modernist style. It shows Joseph, Jesus` father, holding the infant Jesus and the inscription reads `and the child grew and waxed strong in spirit`. At the bottom is inscribed `William Henry Cowley 1887-1969`. On the north-east side of the nave of the church, to the left-hand-side when looking at the altar, there are three small windows. Normally these would be in the north side of the nave, but the obscure positioning of St Silas, with the altar facing to the south-east instead of east to fit in to the available plot of land at the time with its Victorian grid iron pattern of housing, did not allow for this. These are memorial windows to the departed and show various scenes from the New Testament. They are somewhat ambiguous at times, as if the artist was trying to please his client in sympathy of the occasion, so there is quite a lot of mixed symbolism and artistic licence. They were made by Heaton, Butler, and Bayne, London. Left, Jesus and doubting Thomas; right, Jesus with his mother and Mary Magdalene; above (circular) a lamb with the St Georges cross. 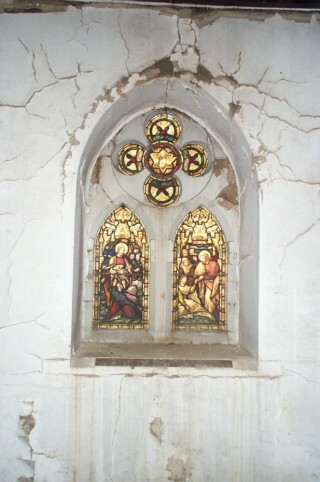 There are other various details in this window, eg. floral motifs. 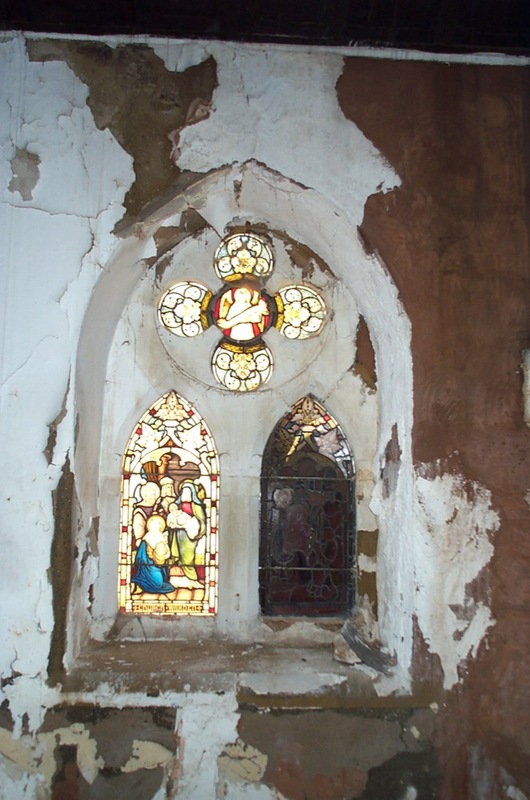 There is a metal plate on the window sill below the window with inscriptions which read `In memory of John Blackwell Blackbird who died Feb 26th 1878 aged 26 years` and “Blessed are they that have not seen yet have believed”. Left, Jesus walking on the water picking up St Peter, the other disciples look on from the boat in the background; right, Jesus healing Jairus` daughter; above (circular) the dove of peace which was at Jesus` baptism descending from the star of Bethlehem. The metal plate on the sill below the window reads `In memory of Anna Blackwell Blackbird who died Oct 22nd 1875 aged 18 years` and “The maid is not dead but sleepeth”. 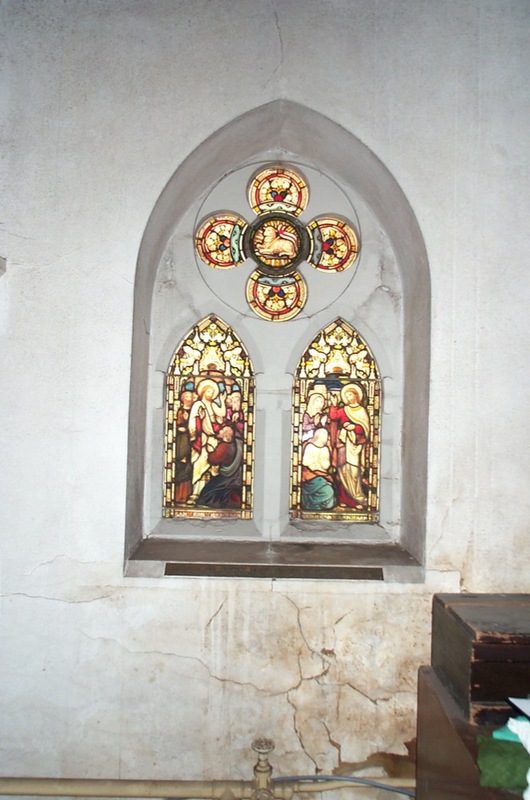 The two windows, left and right, contain the same narrative which is the Angel Gabriel (left) appearing to Mary (right) announcing to her the birth of Jesus (this is called the `Annunciation`). In Gabriel`s hand is a reed, like a writing implement, which symbolises a messenger, and in the background (right window) are Elizabeth, Mary`s cousin (six months pregnant with John the Baptist), and her husband Zechariah. There is a strange narrative story going on here, in Mary`s hand she has an urn, similar to a cremation urn, and in the circular window, above, as well as there being four Angels there is a phoenix in the centre. Could this be depicting `phoenix rising from the ashes` as a memorial to the deceased? 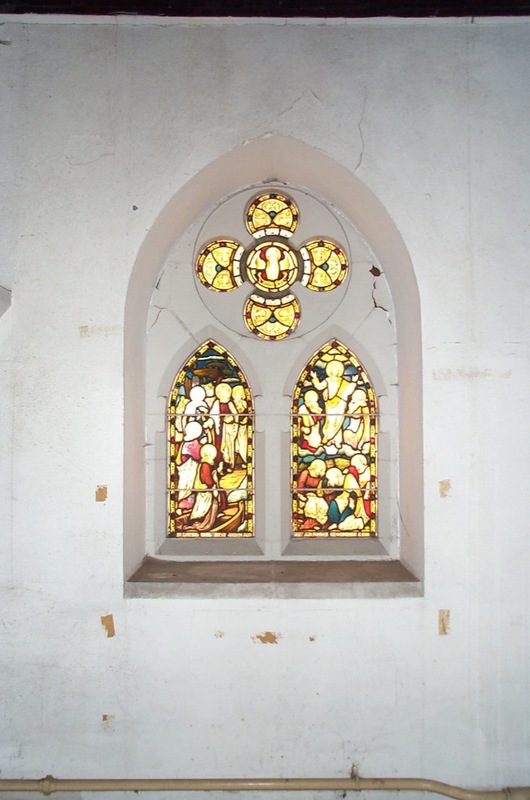 There is an inscription which reads across both windows at the bottom “To the Glory of God and in loving memory of Alice Maud Clifton. Died January 1st 1908 aged 42. Dedicated by her mother Jane Cobby”. On the south-west side of the church, to the right-hand-side when looking at the altar, there are four small windows which normally would be in the south side of the nave. These are also memorial windows to the departed and show the four gospel writers, or evangelists, with their symbols. They were made by Kayll and Co, Leeds. I apologise for the glare, but the afternoon sun was affecting these windows quite strongly when I photographed them. 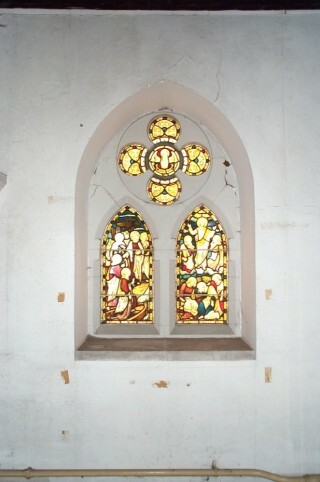 In the circular window, above, is inscribed `St Johannes` with the symbol of an eagle and surrounded by floral motifs. Below, on the left, is Jesus calling St John off the boat to become one of his disciples; and to the right is the transfiguration of Jesus with St John and another disciple at his side, while below the other disciples are overawed. 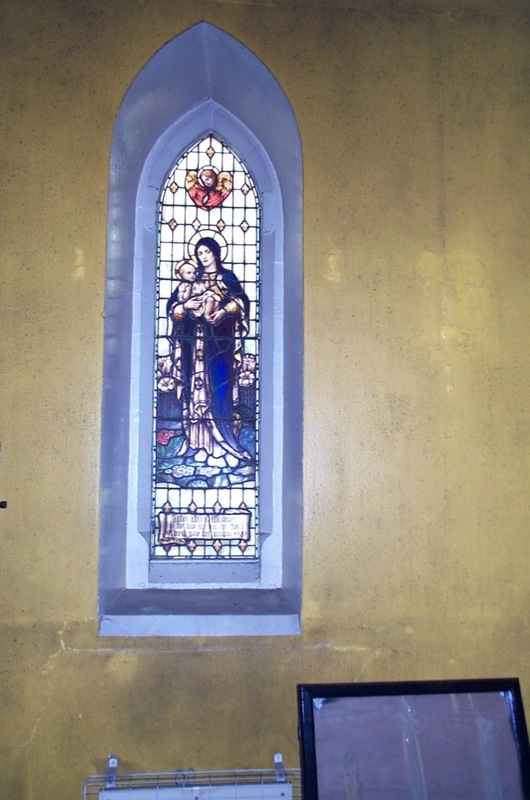 In the window, at the bottom, is an inscription which reads “In loving memory of James and Mary Ann Foster who died 1885 and 1886”. In the circular window, above, is inscribed `Sanctus Lucas` with the symbol of an ox and surrounded by four Angels. Below, on the left, is Jesus with the sisters Mary and Martha running out to greet him; while on the right is Jesus preaching the Beatitudes. In the bottom of the window is inscribed “To the Glory of God and in loving memory of Foljambe Foster. October 16th 1897. By his wife and sister”. In the circular window, above, is the symbol for St Mark, the lion, surrounded by floral motifs. 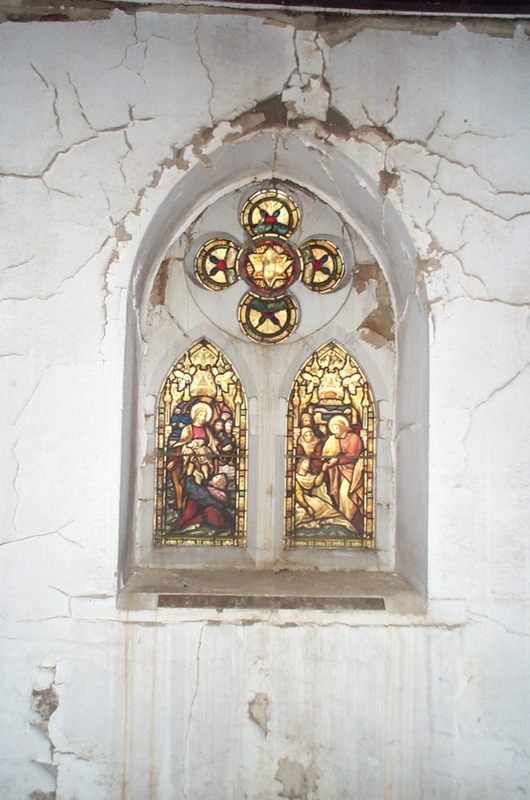 In the left window is a depiction of the baptism of Jesus by St John the Baptist, and it is inscribed at the base “In Memoriam”. The right window is missing. In the circular window, above, is the symbol for St Matthew, the Human/Angel, surrounded by floral motifs. 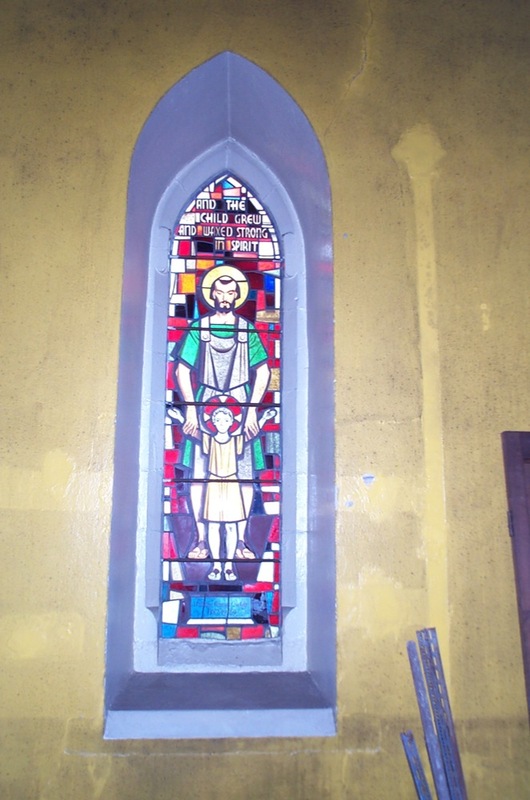 The left hand window shows the presentation of the infant Jesus by his parents to Simeon in the temple; and the right hand window, which is obscured in this photograph by a board on the outside of the church so that it cannot let light through, shows the adoration of the shepherds at the stable in Bethlehem. 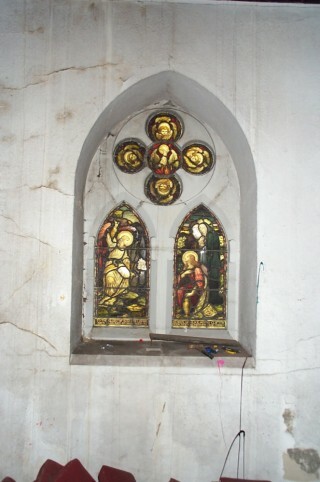 Across the windows at the bottom is inscribed “Church Warden 1876 – 1890”. This page was added by Jennie Beard on 19/01/2015.